LAMM AT LARGE: Can The Players stand on its own? Every player I’ve heard talk about it likes The Players moving from May back to March. More rough. More wind. 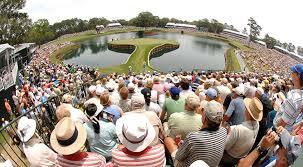 The TPC Sawgrass Stadium Course will play more like architect Pete Dye designed it to play. Every fan I’ve talked to prefers the tournament in May. Warm weather. Warm weather. Warm weather. I’m still not certain why the PGA Tour was willing to move its signature tournament to accommodate the PGA Championship, which was moved from August to May, but it did. The big question now: has The Players grown in stature enough so as not to be viewed by the media and golfing public as a warm up to the Masters? Before the move to May 12 years ago, nothing bugged Tour officials more than player interviews being dominated by questions about the Masters. Over the last decade or so, The Golf Channel and broadcast partner NBC have hammered home how The Players is a special tournament, clearly the 5th most important tournament of the year. That, plus the vast majority of Tour players growing up watching The Players has clearly made the tournament a big deal in the minds of the golfers, the media and most serious golf fans. No longer is there talk about The Players being a 5th major. That’s good. You don’t anoint a major, it just happens over time. The big picture is the Tour compacted its schedule so the last meaningful putt of the year falls before football season. And the Tour thinks The Players can stand on its own. That makes sense. The TV ratings will be revealing.